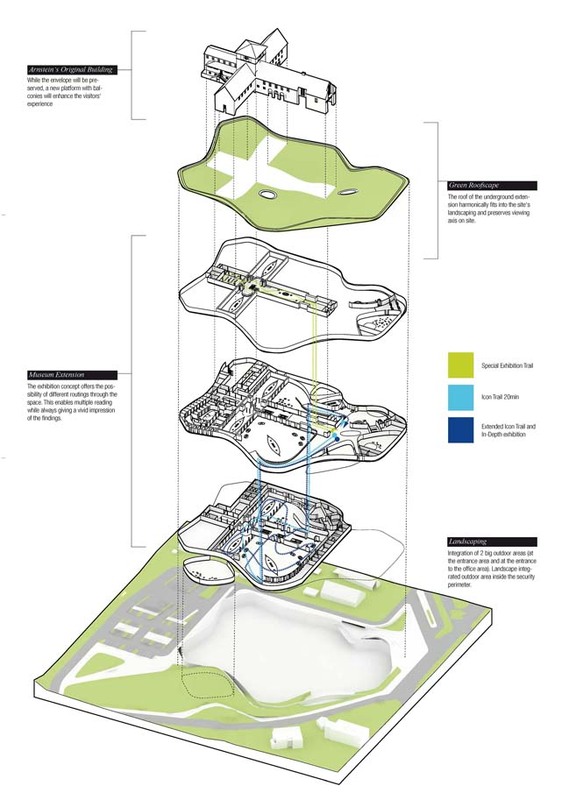 This architectural concept was designed by GRAFT for the Viking Ship Museum in Oslo to create a unique outdoor museum complex in the center of the Bygdøy peninsula. 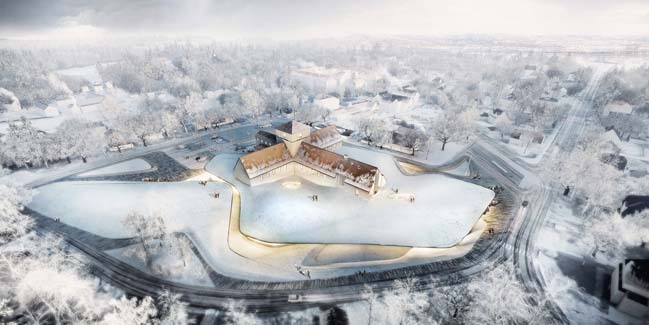 Follow the architects: The long and vivid history of the Viking Museum and its presented findings unfold in a continuous motion within and around the new landscape that houses the extension. The draft aims to protect the residents’ and visitors’ view of the area in the north while sensitively augmenting the landscape features on the given site. 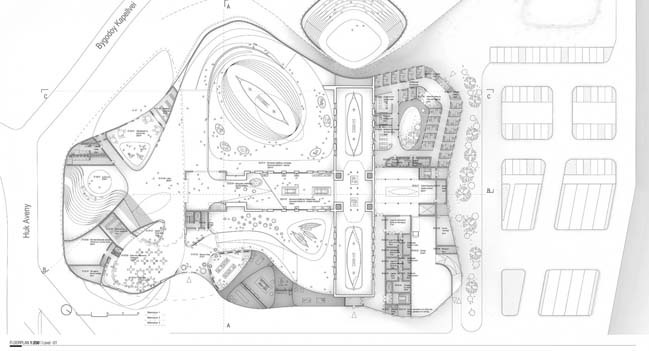 Respecting the urban scale of the neighborhood, the new museum is integrating its new volumetric program within a topological form, blending itself into the park-like landscape surrounding the historical building and the more open land north of the site. By pushing the new development underground, the neighborhood character is not altered by a new, large building, but preserves the existing visitors’ experience. GRAFT’s design for the museum’s extension maintains and accentuates the essence and character of the original building, designed by Arnstein Arneberg in 1932. Contrary to the existing, relatively closed building, the museum is integrated into the landscape and invites visitors inside. 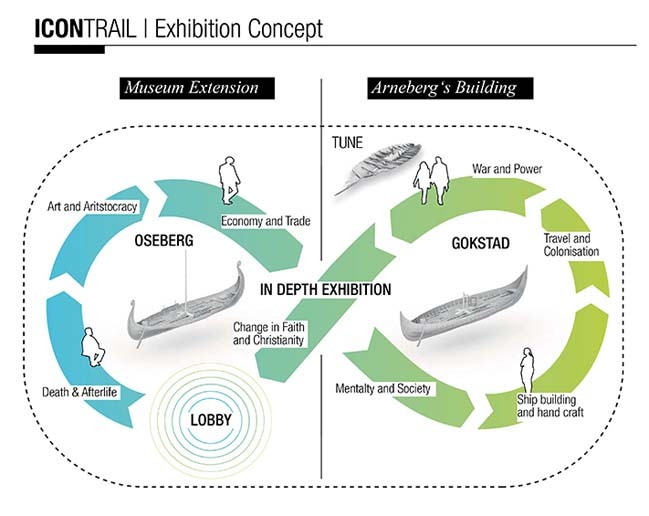 The extension will, in its architecture, function as an open heart integrated into the landscape and building concept, giving the icon trail, the three Viking ships, and the special exhibition space a new environment as well as a new point of view towards Arneberg’s museum. The heritage of the museum building itself is exposed as a ship in the waves. Like a Viking ship on the sea, Arneberg’s building floats inside the grassy roof-scape of its extension. 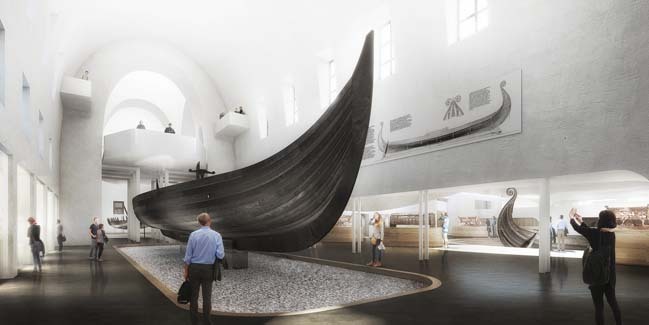 The expression of the new landscape and roof of the project acts as a reference to the museum’s vessels crossing a vivid sea, but also become a reminder of the Viking’s traditional ship graves and burial hills, in where the three vessels were found. The visitors can now experience the excitement of the ship’s finding and the full vast and elaborative collection of the museum in a newly interpreted way. The structural design supports the architectural concept by actively using the intended geometry for an integrated structural solution. It consists of a large span, free form shell roof, which aims to primarily carry its own load via a careful modelling of the support points, the edge beams and the curvature of the shell. Once inside the structure, a newly designed “Icon Trail” leads the visitors through the new museum. Chronologically ordered, it opens up to the visitor in the museum’s big rotunda, giving an introduction with the Vikings’ concept of death and afterlife. 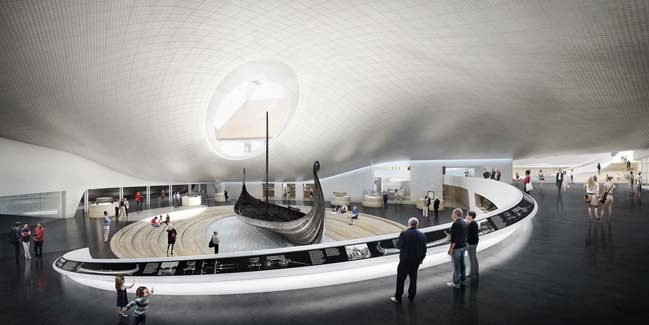 Therefore the roof-lights can suggest an architectonical interpretation of the entrance to Valhalla, adding up to the sacral narrative of the historic building and overlaying the experience with the findings of the three Viking graves.